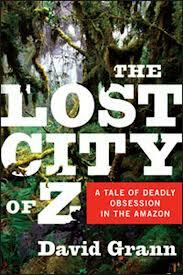 The Lost City of Z: A Tale of Deadly Obsession in the Amazon by David Grann was a pretty compelling read about famed English explorer Percy Fawcett, his search for a mythical city supposedly deep in the Amazon and those who later searched for Fawcett and information on what happened to him. It was a well written book on some fascinating subjects and while it perhaps could have been shorter, the ending was well worth waiting for. There was some really excellent material from Grann that brought to present day some of the goals of discovery, challenges faced and cultures encountered by Fawcett close to a century ago. Thinking of books I've read in the past, the subject of exploration brought to mind the excellent A Sense of the World by Jason Roberts on blind explorer James Holman. Also, after reading The Lost City of Z, I found a very complimentary and thorough (perhaps best not read until after for someone who intends to read Grann's book) New York Times review "An Explorer Drawn to, and Eventually Swallowed by, the Amazon" written by Michiko Kakutani.